So…You Want to Become a Learning Performance Ninja – Good Choice! 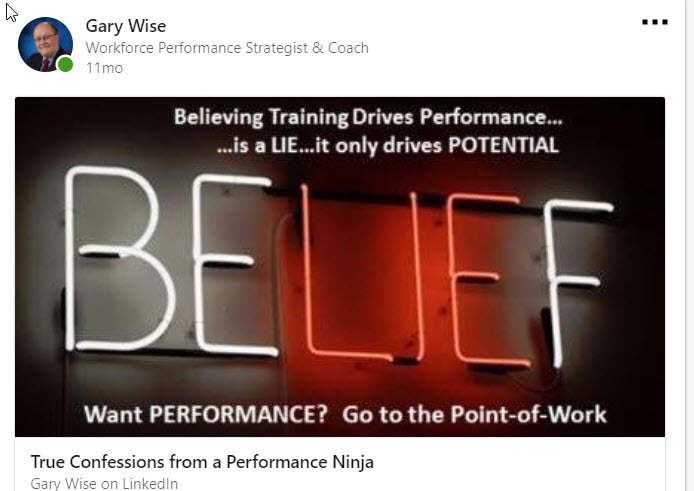 This is a true story, a pivotal story in my career, that validated re-thinking the significance of adopting an evolved strategy using a tactical Learning Performance Assessment (LPA)methodology embedded in a Learning Performance Solutions Discipline called DRIVER…and of course, becoming a die-hard learning performance ninja. It was a Monday morning. Early. I’d already sucked down three cups of coffee…not counting the venti bold with a shot on the way to work. I could no longer hear the ringing in my ears due to the buzz in my brain now masking all other real or imagined internal bodily noises. “Good morning, Gary, this is Bob Johnson!” Bob was Sr. VP Sales & Marketing, also an early bird. Tom was VP of Sales and reported to Bob. Marketing University was a branded partition on our LMS exclusive to the Marketing discipline. “Many things are not happening the way I think they should. The product development cycle is not performing well. Competitive pricing is a struggle. Marketing Communications are not aligned with Product Management and Promotions.” Bob lamented, his voice trailing off like he pondered more issues. This was great, I thought, another assessment opportunity already on the radar and fresh off a successful first mission. “Okay, that helps. I should do another learning performance assess…” I started to describe the logical next steps before Bob yanked me off the rails. Moving to the lite version amounted to a covert learning performance consulting “ninja” move. This meant I was still going to accomplish another learning performance assessment but in a stealthier manner. Actually, this was more like getting an agreed upon approach from the stakeholder…lying convincingly to his face…and then doing what was necessary to find the root causes behind the less-than-world-class performance of Bob’s marketing staff. This was the maiden voyage of what has become my “go-to” methodology. What I uncovered shocked me for the most part. The distribution of learning performance restrainers was scattered over six categories; making a formal “training” recommendation impossible because there were too many other moving parts…too many root causes…too many root causes that had nothing to do with a training solution but everything to do with deficient performance. A training solution that relied upon a brand spanking new marketing curriculum would never touch the most profound performance gaps. I found myself at a decision point. Take Bob’s order for training and give him what he wanted or put the real reasons why his world-class aspirations were waaaay out of reach of upgraded training on his desk…and shine the light on how performance was not going to be world class no matter how good the new marketing curriculum might become. It’s called improvisation. My proposal consisted of a single sheet of paper with a big pie chart centered on it. I had all my verbatim responses in a folder that I “Billy Grahamed” during our conversation but never had to consult; we never got that far into our meeting. I mean really…what was left to consult when the SVP Sales & Marketing had just been blown out of his socks with the results of a single page illustration from the findings of a covert, ninja, learning performance consulting effort? When I laid that single sheet in front of Bob, I pointed to the 20% PEOPLE/CAPABILITY category and said, “This is where your Marketing University curriculum lives…along with Leadership, Clarity of Roles, Expectations on Performance Goals, Communications, Change Management…and yes…Training. Bob sat back, steepled his fingertips in front of his lips, and just stared at the pie chart. I’m not sure if his silence was driven by unmistakable evidence that he might be part of the problem, given leadership was included in the People/Capability bucket, or if I’d simply ripped open Pandora’s Box o’ Root Causes on his desk, and he mentally needed time to sort through his options. Truly, there really weren’t any options to consider with the hard evidence from the lips of his own team staring him in the face. Mission accomplished…the conversation had been successfully changed. Without articulating it, Bob admitted that Training was not going to drive performance. He recognized there was an entire “ecosystem” that required attention and Training may have been only a small percentage of what would precipitate world-class performance of his team. What morphed out of Bob’s I-don’t-have-that-kind-of-time resistance posture launched a Six Sigma Black Belt initiative to tackle the workflow and process issues; a marketing attitudes and values survey requiring every staff member to participate, and yes…with the proper focus and survey results in hand…an out-sourced Marketing University curriculum evaluation…a rebuild effort from world-class marketing gurus…and development of a Leadership Academy. In all, it took 14-months to stabilize the Marketing Learning Performance Ecosystem despite not-having-that-kind-of-time. Back to that minefield I mentioned earlier. The larger risk in taking a ‘learning performance’ approach over just taking an educated SWAG on a new Marketing Training Curriculum was not that the ultimate outcome may fail to improve the performance outcomes; it was enduring what I guarantee you would certainly happen next. The Training Paradigm mindset in Bob’s head was intact. ‘I have a performance issue…so train my team with better courses!’ He believed the lie. He could not see or imagine there could possibly be another option. Paradigms do that to people…and that’s the core reason to shift the conversation. Therein I knew the danger existed…navigating the minefield…ducking and covering because what would’ve come next were the endless meetings to explain why performance across the Marketing team had not improved to world-class level. After all, we now had world-class training in place, and being further blinded by the myth that training drove performance…only one question can be asked – What gives with the new Training content, Gary? The answer must be that the new training courses selected were ineffective…less than world-class quality…or worse…the Director of Sales Training was a screw up. Been there…done that…too many times. Performance happens at the POINT-of-WORK…ONLY at Point-of-Work. If it’s performance, you seek…GO THERE FIRST! And why not embed performance solutions enabling LEARNING to happen there too? And there you have the entire point of this story and the guts of the learning performance paradigm. If I had not gone downstream to the Point-of-Work with a learning performance assessment, I would’ve only been 100% effective on 20% or less of the problems…and left my team standing in the middle of the minefield waiting for another call from Bob to explain our way out of what my key stakeholder could only see as a major screw-up. My screw up…an epic Training fail! The simple act of placing that pie chart summary down in front of a stakeholder who is paradigm-challenged is the perfect…repeat…perfect step-change conversationstarter you can have without ever saying a word. Simply point to what training may and may NOT do to close discovered performance gaps. …and then you’ll have earned the right to dance like only a ninja learning performance consultant can dance…right before spiking your folder full of verbatim interview responses like a crazed wide receiver slamming a touchdown pass into the ground in the end zone. Want to adopt the process of Learning Performance Assessment? Want to learn more about DRIVER? Michiel, thanks for reading. The pie chart represents distribution of responses to interview questions I use in the LPA across six categories. No real science unless you consider listening as science.